The status of craft in the world of fine art is hardly a new subject: it has been famously debated and discussed by 19th century thinkers like John Ruskin and William Morris, but also by modernists like Clement Greenberg and Harold Rosenberg. 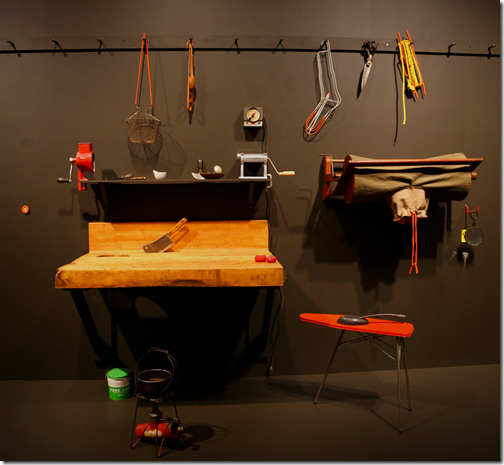 Since the early 1800s when the separation between craft and fine art took root with the development of the division of labor in industrial production, this subject has been at the core of much economic, social, and cultural inquiry. Perceived as having the potential not simply to substitute but also improve the quality of man-made objects, and doubtlessly increase output and profit exponentially, the automation of industry demoted craft’s importance, which until then had been essential to cultural as well as economic production. This demotion paved the way for fine art to take a superior position. Ironically, from an etymological perspective, craft (from German Kraft for power) ended up once again where it had started in antiquity, and where all art (from the Latin ars) began – in the realm of pure skill at the exclusive service of function. And this skill was just no longer needed since machines did things so much better and faster. So art of the modern period needed to be other than skilful – it needed to be cerebral. But if we try to really separate the two fields we see it’s not so simple. However, we can quote Rose Slivka who defines craftsman as he who “incorporates acknowledgement, however implied, of functional possibilities or commitments (including the function of decoration) – as long as he maintains personal control over the execution of the final product, and he assumes personal responsibility for its aesthetic material quality – it is craft.”Meaning that if the maker alludes in any way to function, and is in charge of both design and production, and leaves nothing to chance (artists should not be so controlling…), then we have to see the object as craft. But if one of these is not part of the equation, then we are free to call it art. So by outsourcing the production of his pots and by pointing out that through the firing process he lets chance have its way with the work, Picasso’s decorative pots and plates become high art, although they look very craft-like to the contemporary viewer. But unfortunately many sculptors using materials traditionally associated with the crafts, specifically clay, don’t have the same advantages as Picasso. They are called potters or ceramicists, not sculptors, or not even plain old artists. Even Peter Voulkos, the artworld’s token ceramic sculptor, is often still referred to by art critics and historians as a potter. Why this special categorization which smells of contempt? What is it about clay that still makes the art world sceptical? Clay comes directly from the earth and is therefore inherently associated with our dependence on the land – it evokes a pre-industrial romantic past that to many is out of sync with the realities of the modern western world. Contemporary sculpture’s materials have to come out of the contemporary world: refuse or found object, technology, plastics and metal – all these materials point to their own contemporaneity. Contemporary sculpture must be big and it must be tough, just like the world. Not fragile and precious as clay can seem to be. And for it to be really contemporary, without any touch of quaintness, sculpture really should be made by hired labor, not by the artist’s hand. The real artist just comes up with the concepts to be made by craftspeople, highlighting and utilising modern production processes. So because clay is easy to find, relatively easy to use, somewhat easy to control, it is therefore also easy to dismiss. But clay is not at all easy to master, and many important sculptors, like Lucio Fontana in the 1950s and many Futurists before him in the 30s, undertook the task of learning the “craft” of the ceramicist, fine art’s contemptible second-cousin once removed, to create more expressive, more physically engaging sculptures. Mastering ceramics, or reintegrating craft – the concept of “power over material” – is a complex process comprised of not only repetition and practice but of all the contemporary technologies needed for the transformative process to take place, including kilns, tools, glazing, etc. Maybe this process-intensive investment associated with mastering ceramics is the reason that concept is sometimes secondary to form. But should that be viewed as a handicap or an advantage? The medium and the concept need to become partners in art making once again rather than remain in opposition and conflict. And precisely this collaboration is explored to different degrees by the artists exhibiting in Fire It Up, whose production processes range from the typically contemporary using outsourced craft labor, to traditional techniques applied to contemporary subject matter and critique. 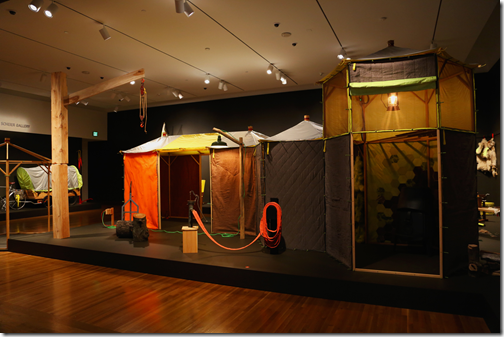 On one side of the “artist-made vs. hired labor” discussion are the garbage bags by Mark Divo, known for his Dada reinterpretations and events. Made of porcelain, that very valuable clay material associated with the decorative arts in wealthy homes (kitschy objects and bibelots), these humorous sculptures at once elevate the Zürisack to the status of precious object (not too far from the truth considering its price and important role in Zürich life) while poking fun at the fetishization of the medium in objects that are ultimately no more than junk, as bibelots ultimately are viewed in the modernist tradition. Collaborating closely with a master craftsman (porcelain is a truly difficult material to create), Mark took the position of artist as conceiver in the true tradition of Dada. Also the result of a collaboration with a potter are Pascal Häusermann’s Panoptical Portraits, a series that channel Bertelli’s iconic 1933 portrait of Mussolini but give it a contemporary twist: the continuous profiles are of Europe’s contemporary right-wing leaders. But whereas Bertelli was keen to camouflage the ceramic quality of the material and instead gave it the metallic/machine look so glorified by the Futurists, Pascal prefers to accentuate his sculptures’ clay features and highlight their vessel-like form by painting them the beige of regular china and keeping their surface somewhat rough and rugged. The Panopticon, to which Pascal’s title refers, was an architectural solution to the prison crisis at the end of the 18th century. It offered a way to oversee the inmates from any point in the building without their knowledge, thus minimising the need for staff. Under the veil of “security”, in the last ten years right-wing politicians have pushed for more and more monitoring of the public sphere, which has led concerned citizens the world over to criticize the ever-more controlling governmental systems. Moving away from the material limitations of ceramic, Mickry 3 nevertheless simulate its aesthetic and utilization: its shine and beauty, but also its tradition of replicating the appearance of yet other materials. 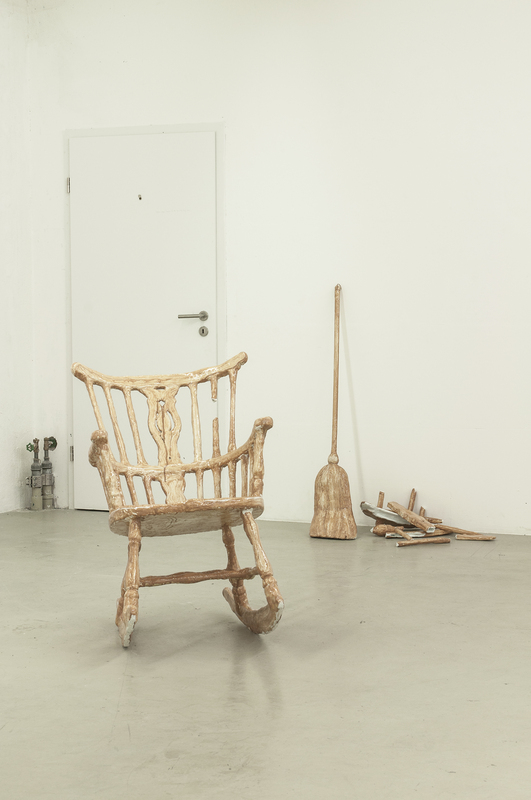 In their installation, a life-sized rocking chair that appears to be of fired clay painted to look like wood, is missing a piece, as if broken. In a corner, a broom, also made from the same material, rests on the wall. It seems that it was used to sweep up the shards of what might have been another ceramic chair, now just pieces gathered in a pile. This work takes us into the home, where this domestic action would take place, and where ceramic objects were most likely to decorate bourgeois interiors. 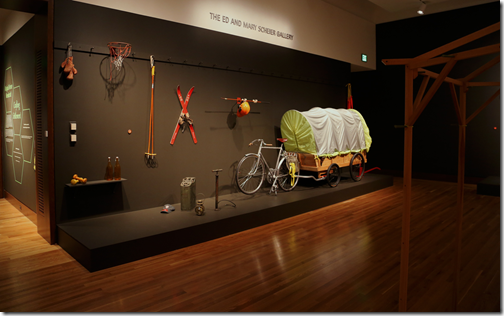 It offers a humorous comment on authenticity, materiality, aesthetics, and social class. Another work that alludes to the home is Aubry/Broquard’s installation of souvenir-sized replicas of modernist sculptures. The duo photographed themselves with these public works on their international travels. As tourists, Aubry/Broquard tried to understand what made these public sculptures, which so often become tourist “sights”, attractive or decorative. 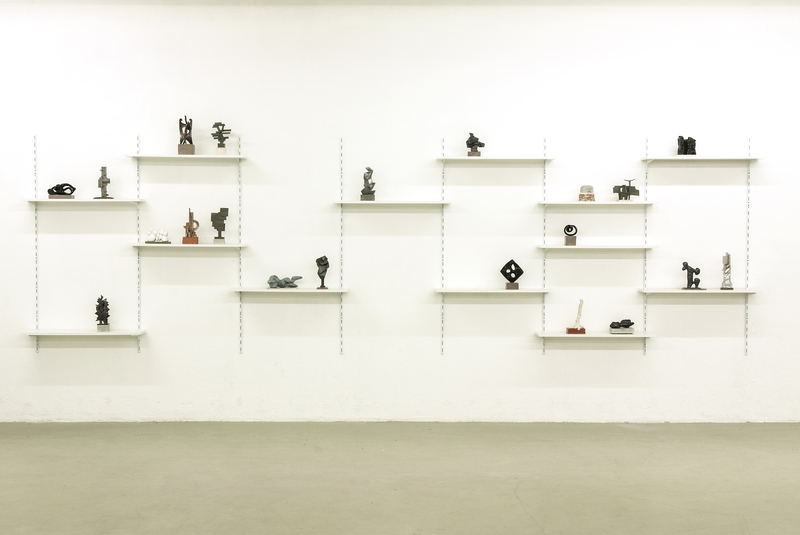 Through the process of recreating them on a small scale, to fit on a shelf as a memento, the artist duo engaged in a personal investigation of the modernist approach to sculpture and its motivations. This led them to also expand the concept of souvenirs, those items that function as reminders of past experiences, while making miniature replicas that are actually original sculptures in their own right. Their ongoing project comments on the notions of public and private space, original vs. copy, function vs. decoration vs. art, social class, and the nature of art as commodity. Christian Gonzenbach’s series of classical busts, molded in silicone then turned inside out – as their titles suggest – are reproduced in ceramic with bronze tones to reveal unexpected shapes and contours. If Hercules retains all of his massive posture, his face nevertheless appears less recognizable. Carved out noses, inversed ears, sinuous forms that might not have been obvious at first glance come to light as the precious coating of the patina and the reflections on the surface yield more information upon careful inspection. This series points to the tradition of portrait sculpture (a glorified face usually made of expensive materials such as bronze or marble), which was directly linked to the wealthy, influential, and powerful. But Christian turns this tradition upside down literally and metaphorically, and creates deformed faces that question the limits of beauty and aesthetics as a whole. The ability of ceramic to replicate the appearance of other materials is further explored in Maude Schneider’s installation Concrete, a wall similar to many low-lying fortifying structures in the countryside of Biel dating back to the 17th century. In this installation, Maude also tackles the ever-present association to functionality that ceramic never seems to shake off. She recreates a fragment of this local construction used to support the agricultural land, but once this structure is recontextualized in the gallery, it loses all utility and collapses entirely into art. The title of the work presents a duality: it refers to the material the artist used to form the moulds for her pieces, which highlights a tension between the natural (clay) and the manmade (concrete and ceramic), but also points to the perception of fired clay’s fragility in comparison to other more modern building materials, despite its long history in construction. Modernism is once again cited, this time by Guillaume Pilet, whose amorphous ceramic forms allude to Jean Arp and refer directly to Giacometti. Influenced by the social nature of hobby ceramicists, Guillaume’s technique owes much to these creatives, while his references are the modern artists that mostly scorned the material. In his work, Guillaume questions the boundaries of “fine art”, and attempts to democratize the field, expanding our notion of who can and cannot be an artist and what constitutes real contemporary art. 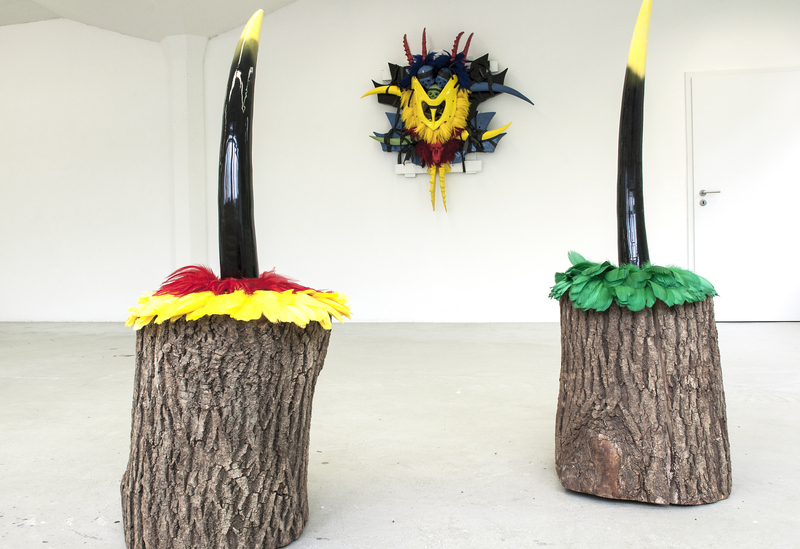 Guillaume Pilet, left: Nature, 2011, glazed ceramic, wood, right: Giacomelting, 2011, glazed ceramic, wood. 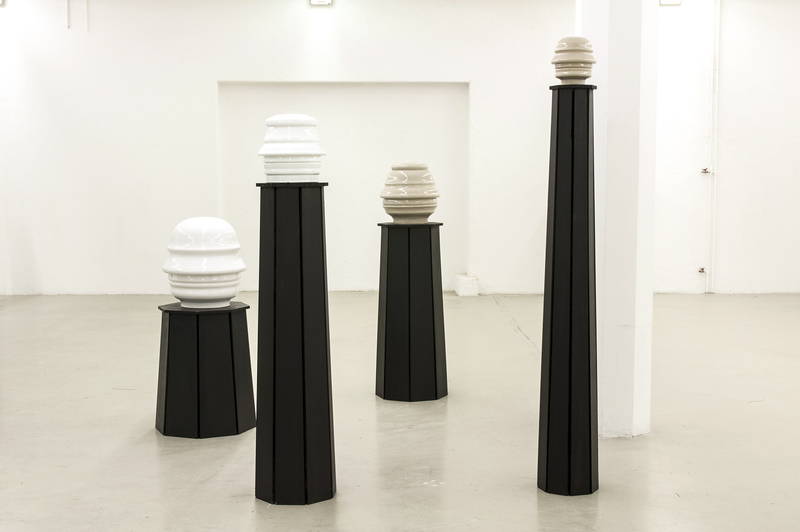 Ceramic’s complicated relationship with femininity, class, and aesthetics is thematized in Mai-Thu Perret’s Ah Marvelous! Ah Marvelous! 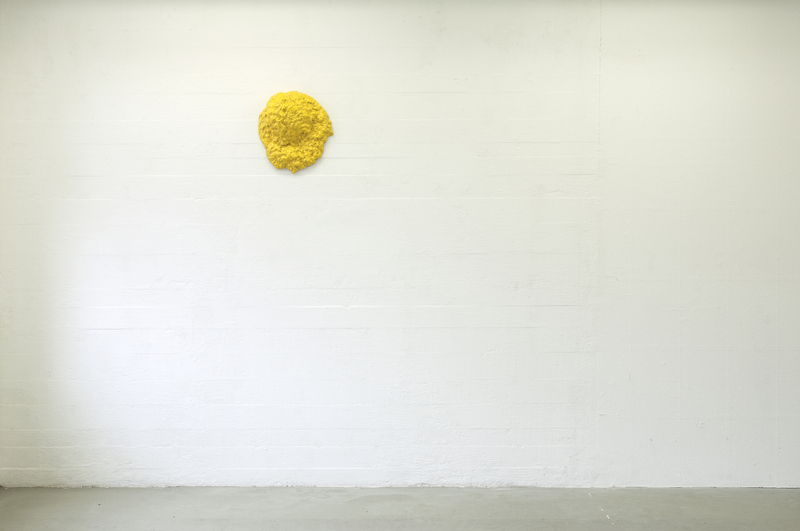 Her bumpy, unruly bright yellow wall sculpture is expressive and gestural. It cites abstract expressionism’s rough painterly surfaces (a male dominated movement), but alludes to the traditionally female occupations of handicraft and decoration through its materiality. The title also recalls the affectation of the “upper classes”, especially the high society women who are so closely associated with the consumption of art and culture. As an object, it points to beauty and its negation, and questions the boundaries between amateurism and professionalism, and craft and fine art. The confrontation between nature and culture is strongly evoked in the work of Fabien Clerc, who mixes natural and synthetic materials to present mysterious and aesthetically engaging forms. 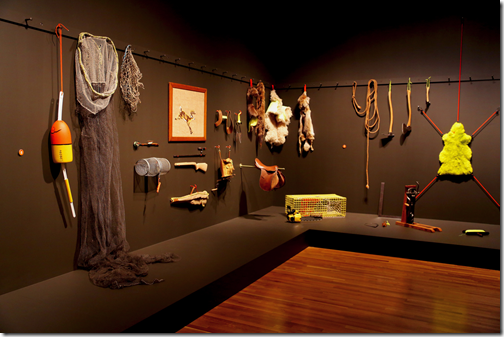 Fabien’s pieces combine references to vodou, Africa, and black magic to conjure disparate cultures in which pottery and other fired clay objects still play central roles in cultural production. Identity and beauty are important subtexts in his work, where symbols of death are aestheticized and human intervention into the natural environment is also seen to be the point of departure for the artistic act. The assemblage technique used by Loredana Sperini is prevalent in much contemporary art and was a subversive method first innovated by modernist artists. 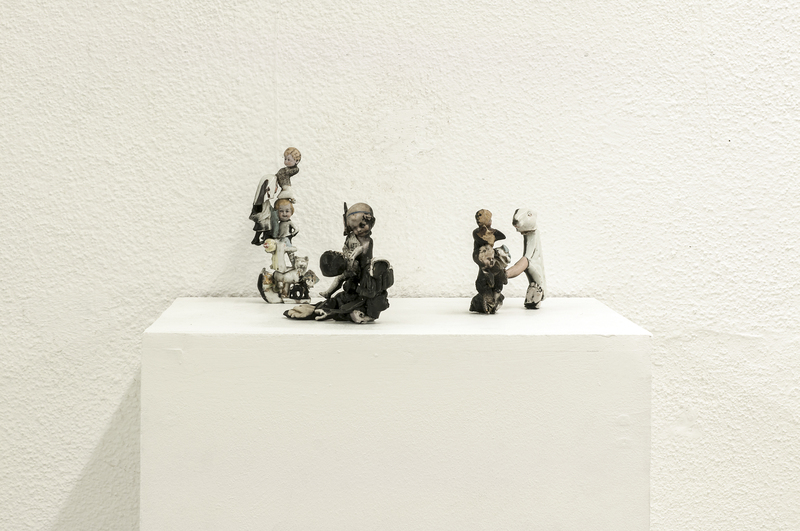 She uses fragments of found ceramic figurines and recombines them in absurd, often quite unsettling configurations. Suggestions of memories and anonymous personal histories are then transmitted through the components as they are reassembled and given new lives. This collage method allows the artist to mix craft and concept to reach a perfect balance that doesn’t overshadow the importance of either. Loredana’s fragile and delicate work also alludes to the feminine association with ceramics, as these figurines are clearly the sort of miniatures that one might find in a vitrine. In the work of the artists of Fire It Up we see a concern with craftsmanship, the interest in making objects that have an aesthetic force. And yet none of the artists collapse into pure aestheticism, functionality, and decoration, but rather insist on balancing skill with concept to create contemporary sculpture that is relevant and apropos, and whose medium is embraced as the equal of other contemporary materials. 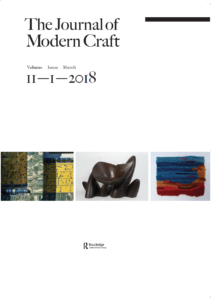 The Journal of Modern Craft has made great strides in deploying craft as a fluid concept, as pertinent to the consideration of contemporary art as it is to reading material cultures throughout the globe, statements of artistic practice, and the politics of skilled labor. But let us consider, for a moment, the age-old stereotype embedded in a widespread popular understanding of the word “craft” that refuses to budge: the granny with her knitting needles, spending her free time making (often with considerable dexterity and skill) toys for her family, mittens, or even an itchy Christmas sweater. Amateur crafts, hobbies, pastimes, and do-it-yourself activities constitute the most widespread type of craft activity in Western economies. Kirstie Allsopp in Britain, like Martha Stewart in the US, urges everyone to have fun on sewing machines. Regularly released “how-to” manuals within a single craft medium probably have a larger circulation than all the academic tomes on the subject combined. Encouraging leisure-time making is one of the big businesses that has shaped our cultural and economic landscape in recent times. Twentieth-century scholars—from the era of what Siegfried Kracauer called the “mass ornament” onward—have been slightly more concerned about amateur craft practice. Yes, Theodor Adorno, Hannah Arendt, and a whole range of thinkers from across a wide political spectrum do marginalize amateur practice (a good recent example is Andrew Keen’s Cult of the Amateur, a polemic bemoaning citizen journalism and crowd-sourcing). But studies from social history and anthropology prove more sympathetic. Among these, Steven Gelber’s Hobbies: Leisure and the Culture of Work in America sets the tone for a deeper understanding of how the work ethic drawn from professional practice structures freely chosen leisure activities. This interaction between spaces of work and leisure constitutes a major concern for thinkers studying everyday life, such as Henri Lefebvre, Michel de Certeau, Ben Highmore, and Elizabeth Shove, and their work helps inform much-needed critical reception of the recent amateur-led revival of many craft practices. With the intellectual groundwork laid for a reassessment of this marginalized element of mass material culture, many historians have recently turned their attention toward the late nineteenth-century moment when domestic handicrafts became hugely popular among middle-class women (for example the work of Clive Edwards, Judy Attfield, Emma Ferry, and Talia Schaffer, whose book Novel Craft is reviewed below). 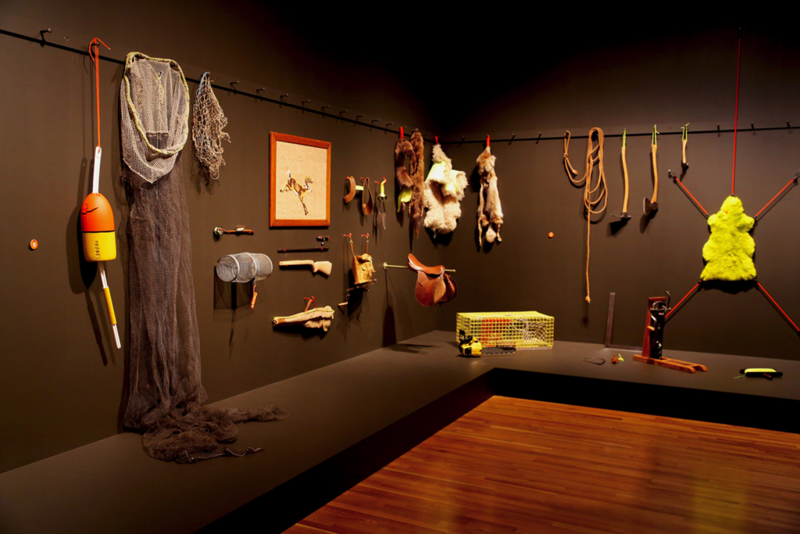 Essays by Akiko Yamasaki and Janice Helland in this issue can be aligned with this scholarly trajectory, which considers handicraft as a site of female self-expression within hegemonic patriarchal structures. Most existing work in this area focuses on Anglo-American geographies, but a translated chapter of Yamasaki’s 2005 work, “Handicrafts” and Gender in Modern Japan [Kindai Nihon no “shugei” to jendaa] attests to the global reach of this phenomenon. Like many accounts of nineteenth-century domestic handicrafts, Yamasaki’s research makes use of advice manuals and journals as historical evidence. She uses these sources to demonstrate the gendering of shugei, a term that simply denoted hand-skill at the start of the Meiji period, but came to describe distinctly feminine activities, such as sewing and cooking. Yamasaki explains how the semantic separation of shugei from associated terms mirrored the wider cultural expectation, advanced by advice literature and educational establishments, that women spend their free time engaged in domestic accomplishments that protected their gender identity. Helland expands our understanding of domestic handicrafts at the margins of the British Arts and Crafts movement by recalling the early history of the Home Arts and Industry Association (HAIA), an organization that promoted domestic arts through regional education and annual exhibitions from the mid 1880s onward. There has been a tendency to view the HAIA as another example of Victorian philanthropy, with its moralizing instruction dispensed by approved arbiters toward subjects in need of improvement. 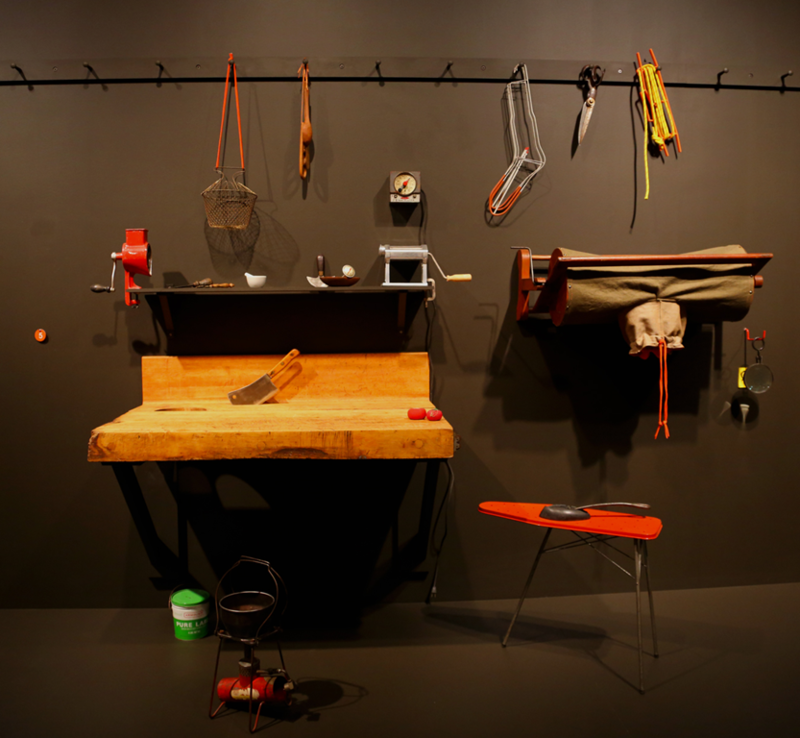 Yet, Helland probes beyond the organization’s rhetoric of aristocratic cultivation to reveal how domestic handicrafts provided an opportunity for women to market their own skills, both as teachers and as exhibiting artists in many of the annual exhibitions. Ruti Talmor’s ethnography of the Accra Arts Center in Ghana seems at first glance unrelated to amateur productions of the late nineteenth century. The article explains how the making of djembe drums has proliferated within the Center due to its popularity among tourists as a generic symbol of Africa, and how the proliferation of this craft has adversely affected the diversity of production that existed beforehand. Talmor skillfully explains the division of labor intrinsic to djembe production, and how it encourages de-skilling among young Ghanaian men who focus on learning one skill in the productive chain, rather than becoming multi-skilled through the traditional avenues of apprenticeship learning. We might bemoan the neoliberal economy that has flattened craft diversity within the Arts Center, but as Talmor describes, many young men find a quick way of acquiring the skills needed to ensure their subsistence by sidestepping apprenticeship learning. Just as was the case for the late nineteenth-century handicraft practitioners, an accessible skill (even if it has to be learnt and honed) has become a means of quickly attaining a foothold within the marketplace, and this accession is both speedy and disruptive. See contents of 5.3 here.